While there are many ways of determining this, this report represents one set of authoritative costings. F-35A - $116.2 mil a pop without RDT&E, better.. frankly, can't understand the FIFTY mil price difference between A and C.. for what? landing gear and tailhook? UH-1Y - $34.0 mil a pop, shouldn't the USMC stuff be actually cheaper ??!! CH-53K - $218.5 mil a poop, without RDT&E.. I know it's LRIP, but... WHAT ????!!! AIM-120D - $1.37 mil for USAF, $1.26 mil for US NAVY, any particular reason for the price difference? Don't forget that this does not include wing tanks, a FLIR, or an IRST which brings its price right up there with the F-35A. Program acquisition cost is different from other costing methodologies. Can include Milcon, upgraded equipment, related to project. The more mature the program, the lower the procurement costs reflected in the program acquisition cost... usually. The SAR reports give unit costs in both program acquisition unit cost (roughly same as PAC + RDT&E/ units, but usually an estimate in TY dollars in SAR reports) and average procurement unit costs. Last edited by FBW; 7th August 2017, 22:43. Or perhaps the DoD has several different ways of reporting costs which are incomprehensible to those who don't spend time distigushing between them. Not every nation reports costs like the French Senat which gives one figure for the Rafale program's unit cost, without any breakdown of what is included. Of course, it is harder to hide the total program cost, which belies the rosy numbers trotted out by some. And what of the PAUC equivalent for the Rafale? 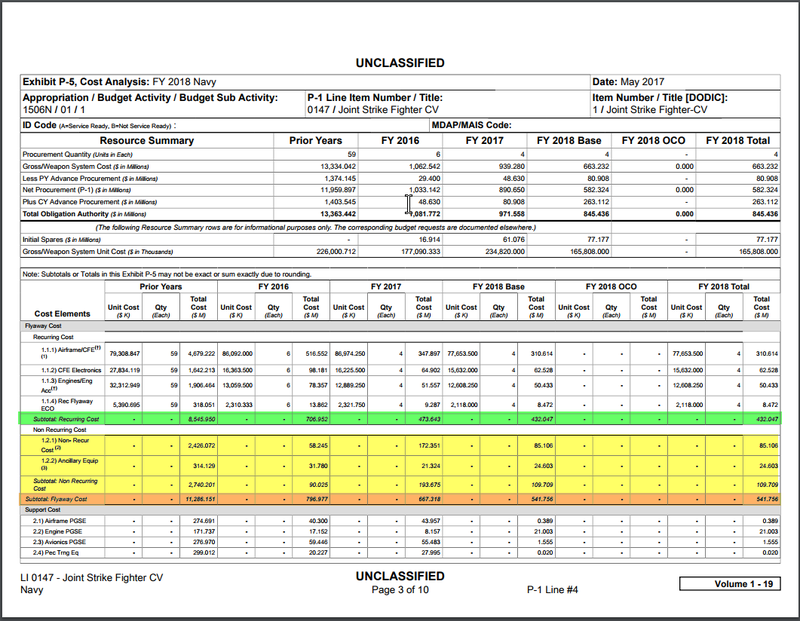 Go look it up, program cost divided by units. Then come back here and reflect on "hiding" costs. Last edited by FBW; 7th August 2017, 22:49. They do, it's called unit recurring flyaway (URF) and it's been reported a million times. LRIP-10 was reported as 94 million. Last edited by FBW; 7th August 2017, 23:20. The numbers given are basically weapon system costs, which are different than the flyaway costs typically used to compare aircraft. As an aside, the Air Force doesn't have non-recurring flyaway costs for the F-35A. 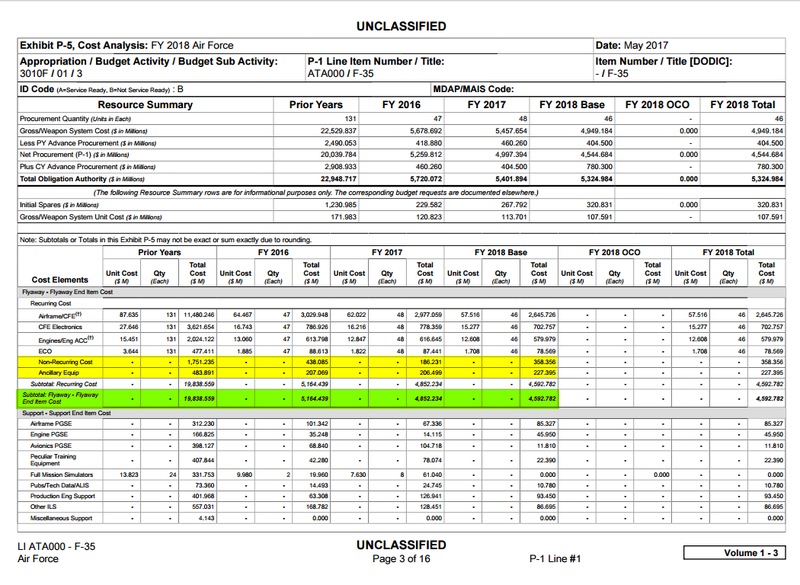 The USAF did post "Non-Recurring" (YELLOW Lines in the pic below) costs for the F-35A in the latest budget docs ($7.8mil)... they just added it in as part of the "Recurring costs". 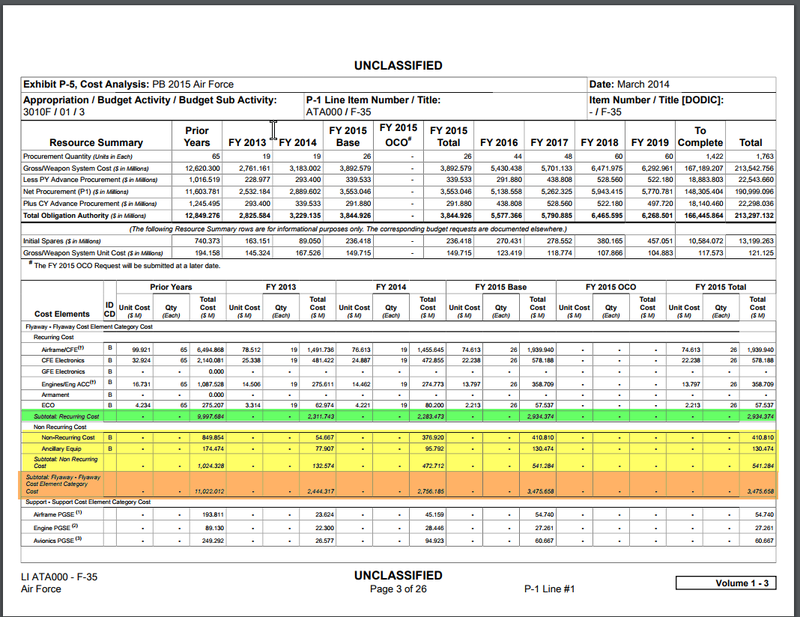 Here is the current USN Budget shown with the numbers in the correct location. Last edited by SpudmanWP; 8th August 2017, 01:47. Oh whoops...thanks for pointing that out, I missed that while skimming through the docs. A word of caution in general, The comptroller report was cited by Halloween a few months ago and I had written about why it was not always a good indicator of unit cost since compared to Unit specific cost mentioned in the SAR. I had even pointed to an example of a weapon system in a previous comptroller report where the service was spending tens of millions under procurement for a quantity of ZERO. There is quite a bit of non end item cost recorded here. For most of these systems mentioned the annual FY18 (December FY17 SAR) have been made available and URF, TF, APUC, and PAUC are available for each weapons system. Not that straight forward since the SM6 is a multi purpose weapon that has intercepted SSTs and MRBMTs plus demonstrated surface attack. The AMRAAM derived seeker antenna is still physically larger, has both active and semi active modes, and the missile has a new mission computer. It isn't like they are plucking seekers out of an AMRAAM and fitting it on a larger diameter missile which all of a sudden becomes capable of intercepting medium ranged ranged ballistic missile. $4.3 Million for the SM6 is a very good cost point for the weapon given the capability it offers towards both SBT and LR-AAW. The Navy can get the price lower still but that would entail higher production rates, export (which has been recently approved) and a larger program. Western BVRAAMs these days are running close to or upwards of $2 Million and this is a much larger, more capable surface to air missile. An Active ESSM Blk II would do well to hit $2 Million APUC and it will be a fraction of the missile compared to the SM6. As per the FY18 SAR, the SM6 program cost projections for PAUC have largely been where they were expected to be. The PAUC for the program stands at $4.1 Million while Unit APUC stands at $3.8 Million ($FY04) for a production run of 1800 missiles that account for ZERO exports. Of course unlike the AMRAAM, Aim-9X, or even ESSM, the SM6 or PAC-3s do not enjoy the program size and annual buy rates so that affects their overall cost as well although from a programatic stand point the SM6 has done rather well to leveraged NDIs. A perfect example of this is the peak SM6 annual buy rate that the Navy hits which is 125 interceptors for the program. Army interceptor procurement is similarly low-annual volume and relatively (to its past) small total program size. This similarly gets reflected in their APUC and PAUC numbers. It is basically shifting to a lower program total cost (buying fewer missiles over the same period of time) and smaller share of their budget at the expense of a higher unit cost. How many times does one have to keep going over this concept? Cost reporting requires multiple levels of cost metrics to be tracked in order to better gauge the cost trends of the various aspects involved in the acquisition of a weapon system. An aircraft with mission systems and a full tank of gas may be perfectly acceptable to sit inside and fly away from the factory. However others may be looking to buy simulators, a support package, spares, contractor services etc etc. Hence, each aspect of these costs are tracked and reported and not just the bare bone URF which includes the fly-away aspect of the program cost per unit. Last edited by bring_it_on; 8th August 2017, 03:01.